New research shows cannabis arrests are on the rise at the same time over half of the United States have legalized cannabis in some form or another. One might be tempted to conclude, with over half the United States legalizing cannabis medicinally, or even recreationally, the number of marijuana arrests would be going down. But, one might be wrong. 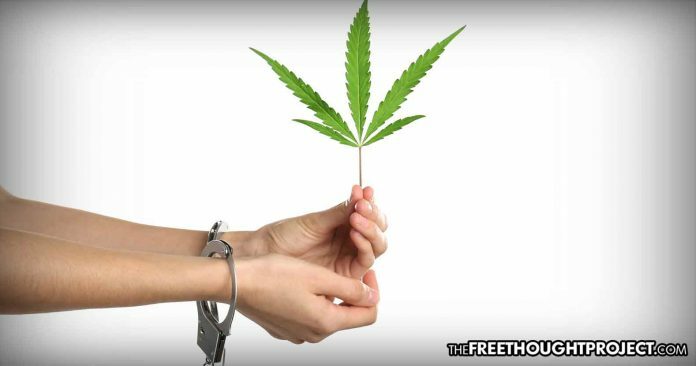 At the same time the American people have been speaking up for their rights to treat themselves medicinally with cannabis, the number of marijuana arrests have also risen. According to law reform activist Tom Angell in a recent article in Forbes, the FBI attempted to hide the fact marijuana arrests are on the rise by not publishing the arrests by drug in its annual data. Angell stated he was able to obtain internal FBI data which shows not only have marijuana arrests gone up but someone is arrested for marijuana once every 48 seconds. For apologists and prohibitionists, the news may be welcomed. But for those who use cannabis for their ailments, the increased rates of arrests will likely be viewed with angst, as well as bewilderment. After all, cannabis kills no one per year, all the while a raging opiate epidemic is killing 30,000 Americans per year. Common sense (which is apparently dead in not only the legal code but as well as law enforcement) would contend to end opiate deaths, a full embrace of cannabis as a medicinal option might be beneficial. As TFTP reported, Boston doctors have an 85 percent success rate in curing opiate addiction using cannabis. For those who’ve been living under a rock, or for those who simply are not awake to the reality of modern-day policing for profit, arresting people for cannabis possession is big business. The prison industrial complex benefits financially every time a cannabis consumer is convicted and sent to prison. So-called “drug diversions programs” likewise benefit when defendants accept a plea deal arrangement to attend such programs. The court systems and probation programs made up of lawyers, DAs, and drug testing companies, also benefit financially for such arrests and convictions. It’s a cash cow for the legal system. But if cops stop arresting potheads, the system loses. The bottom line profits all begin with a simple arrest for possession. Angell discovered, “Overall, marijuana arrests made up 40.4% of the nation’s 1,632,921 drug arrests in 2017” which demonstrates the willingness law enforcement has to continue the status quo. As marijuana arrests continue to rise, so do the number of unsolved murders and rapes across the country. According to VOX’s analysis of the FBI’s latest crime statistics, about 40 percent of the murders, which happen in the U.S., never get solved. Sixty-six percent of the rapes which take place never lead to an arrest. And nearly half of all aggravated assaults do not lead to an arrest. Critics contend the reason why more resources appear to be dedicated to cannabis arrests is there’s no money to be made convicting murderers and rapists. Jailing such perpetrators is not nearly as profitable. But punishing weed users is. Is this justice? Few agree. Meanwhile, all those pot arrests amount to individuals who are now marked for life, accused of trafficking or using “narcotics.” The consequences often lead to a lifetime of not being able to get a job, being forced to work minimum wage jobs, or being ostracized by communities. If ever there were a time this country wakes up to the horrid atrocity that is the drug war—it is now.